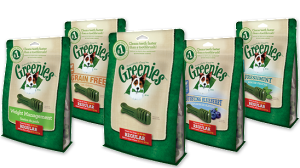 Years ago, there was a big hubbub about Greenies, the dental health chews that people give their dogs to help clean their teeth. Some dogs would apparently not follow the instructions, and rather than chew them, would simply swallow them whole or nearly whole. So much for helping their teeth! Apparently those suckers did NOT dissolve in a dog’s digestive tract. Many dogs needed surgical removal of the Greenies from their intestines. Owner were not pleased. I doubt the dogs were enjoying it much either. So Greenies responded with a new formula that came out a few years ago. It is a bendier chew, but still offers the chewing experience needed to help your dog’s teeth and gums. But if your dog decides to swallow it whole, it will dissolve easily by letting the digestive juices do their job, no surgery needed. I had a personal experience with the new formulation of Greenies a couple years ago that proved these suckers do, in fact, dissolve! A tiny, 4 lb dog swallowed his big brother’s Greenie. It didn’t even make it to the stomach! Instead, it sat in the esophagus, right above the stomach, which I am sure was very uncomfortable for the dog. I could see on x-ray the clump of Greenie stretching the esophagus to 3 times its size! I immediately told the owner to take the dog to a specialist up the road from where I was practicing. They had an endoscope, and could put the dog under anesthesia, reach down his throat, and pull out the Greenie. Easy peasy, right? The owner agreed that sounded like the best plan. Well, when you send people to a specialist, they don’t always go. The people chose to not go, for whatever reason (the dog was miserable), and the dog did not have the procedure. I called them a couple days later (not knowing they never went to where I sent them) to see how the dog was doing. Apparently, over the course of 3 days, the Greenie dissolved, even in the esophagus, which lacks significant digestive juices! I was less than thrilled the dog had to suffer that long (and no one told us!). But I was very impressed at the dissolving ability of the new formulation of Greenies! Here’s the article summarizing the research that University of Illinois performed on digestability. What are other safe and beneficial products to clean your dog’s teeth? Here’s how to tell the helpful from the hype! Canned cat food will not make your cat obese – actually the opposite! Coconut oil does not have magic powers. Sorry. Is it safe to put ice in your dog’s water? YES! Poinsettia plants will NOT kill your cat dead – although she will vomit. Baby bunnies (and other wildlife) will not be abandoned after you put them back in the nest, so please do! Greenies are *still* unsafe for dogs! I tried to send this letter to their company and the form wouldn’t allow it, saying it had “profanity.” As you can see there is no profanity in the letter. Not only do they endanger dogs, but they are unwilling to hear their customers complaints. I am aware that you once changed your formula, because your items were unsafe for dogs. Your chew items are *still* unsafe and causing damage to canines!! I started giving my Goldendoodle your chew brushes when she was finished with puppyhood. Before using your items, her appetite was fine. She was always hungry for her meals and ate with no trouble at all. When I started using your items, her appetite started to drop and suddenly she would not eat a complete meal. Her food would sit in her dish for hours and sometimes she would only eat one meal a day. I didn’t know about the issues with your items at that time, so I tried changing her food three times, to two different brands and three different kinds of food. Nothing helped. My dog was vomiting more frequently, had lower energy and just didn’t seem to feel well from time to time. Then I encountered a dog trainer with over 20 years of experience. She brought up your company’s name before I did, telling me you had to change your formula once, but that these items are STILL completely unsafe for dogs, balling indigestible material up in their systems. She told me to take my dog off of your items immediately. I did and as soon as my dog stopped eating your items, her appetite returned completely to normal. Now she can’t wait to eat her meals and even asks for an extra scoop of food from time to time. A few months after that, I had a conversation with a friend whose dog was sick with a liver ailment. The vet told my friend the daily chew treats from your company were causing the problem. Do you realize what your company is doing?! You’ve put your items under the name of “Greenies” -which makes them sound all natural and completely safe. I believe you are willingly injuring animals and question if your formula was ever actually changed, and obviously, even if it was, you have let down the entire public. Who knows how many other dogs are struggling daily from ailments blocking their systems due to your company. I don’t believe you care about animals. I plan to write a letter to PETA and other Animal Rights Organizations informing them that your company is endangering canines. I can also attest to the new greenies still being unsafe. My dog was eating these new greenies for a while and would vomit nightly and had a string of other intestinal problems that the vets apparently could not explain to me. They changed her diet and gave her antibiotics at least three times. Eventually, I read these reviews about the old greenies (not knowing they were about the old formula) and quit giving them to her. She has not had intestinal issues since. She did, however, absolutely love the greenies treats. I mean she went ravenous for them. I wonder if they have some sort of addictive chemical in them? Do not trust these treats, just brush your dogs teeth. It really isn’t all that difficult. When did your dog have problems? Recently? My lab is suffering now due to a Greenie not passing through. What did vets do to get your dog to pass it? I am very worried. Thank you for any advisement. She didn’t have intestinal blockage, just an inexplicably upset stomach. She was given a probiotic powder, antibiotics, nausea/vomiting meds and pain killers. (Three or so separate incidents) Her vet told me perhaps she had gotten into some “human food”, but this is impossible. This was some time in July and since quitting the greenies treats she hasn’t had ANY stomach issues whatsoever. Sorry about your dog, I hope he/she recovers. My lab ate a greenie quickly and suffered intestinal blockage in 2017. It never broke down completely after several days. Terrible! I will NEVER buy these again. Be aware! My small female Maltese mixed breed (weighs about 8 or 9 pounds) had bladder stones and after surgery was put on a urinary diet and her vet says she can no longer have her greenies. Have you as product she can use? Talk to your vet – It depends on the type of stone. The occasional greenie might be OK! I have been giving these to my 9 month old pug, he is a fiend for them (and food in general). He would run off to a different room and come back less than 5 minutes later having finished it. I’ve always wondering how he eats them so fast until now! I just watched him gum it up a bit and then swallowed it WHOLE. He’s probably swallowed 5 or 6 or more whole at this point and he’s fine. Now that I’ve seen this happen though I definitely won’t be letting him eat them like that again. They make good Kong stuffers when you break them in half, which is super easy to do because they are so bendy. I think if you get any hard ones though you should throw them away.